BREAKING NEWS: Terror strikes Germany Again! 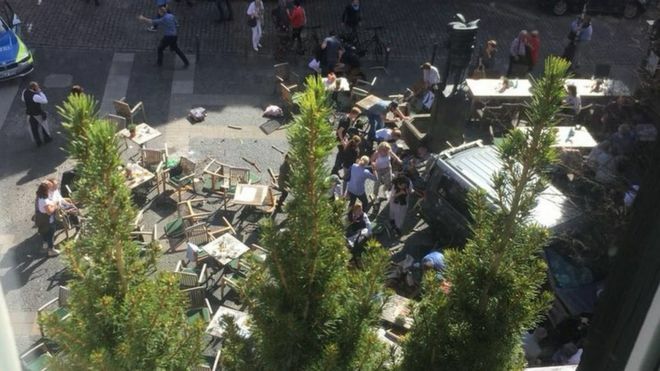 Three people are confirmed dead in Muenster, Germany after a van drove into a people and a restaurant. The Driver is also said to have killed himself according to Police. About 30 people are reported injured in the incident, which occurred near the Kiepenkerl statue in the old town. Many of these injuries are potentially life threatening. The Kiepenkerl statue is located in a popular pedestrian area in the middle of the historic old town. There are traditional inns and restaurants in the vicinity with outdoor seating. Photographs posted on social media showed tables and chairs strewn at the scene. Click here to support the campaign to get us out the EU! Read: "Top Surgeon says his Hospital is now like an AFGHAN WARZONE!" Read: "Tony Blair in new Brexit TREASON!"